Perhaps the Beatles were the first to turn a crosswalk into a recognizable landmark, with their legendary Abbey Road album cover (just do a Google Image search for “famous crosswalks” and photos of the Fab Four– and imitators– crossing Abbey Road will explode across your screen). Anybody who has seen the snapshot of John, Paul, George, & Ringo crossing that otherwise mundane road will likely conjure up mental images of Britain, or maybe a song or two from that album. But another crossing that occured a couple hundred years earlier, on this side of “the Pond,” may be just as famous– George Washington’s iconic crossing of the Delaware River on Christmas night, 1776. This bold and brave moment in time turned the tides of the Revolutionary War and changed history forever. So… where exactly are we going with all of this, you ask? 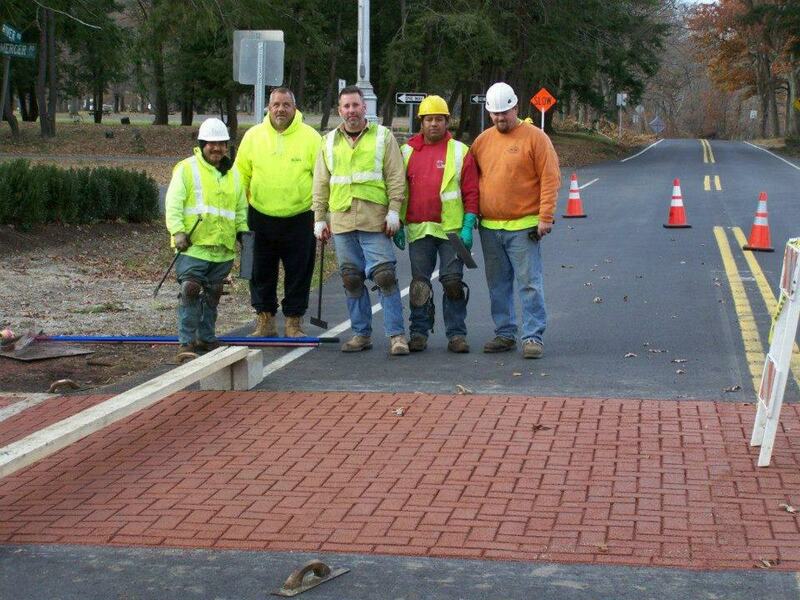 Well just this week, APCON had the opportunity to install a crosswalk in Washington Crossing, PA! Ok, it’s admittedly not quite as exciting as either the Beatles’ Abbey Road or the actual crossing that George Washington & Co. did, but, in our defense, this is also no ordinary crosswalk. Take a look at the accompanying photos and you will see an eye-catching, red brick, herringbone-patterned crosswalk in a rustic wooded setting. But guess what– that’s not real brick! The material used for this crosswalk is called GeoPaveX by Adbruf, which, in a convenient twist of fate that ties in nicely with this story, is a company that is headquartered in England. 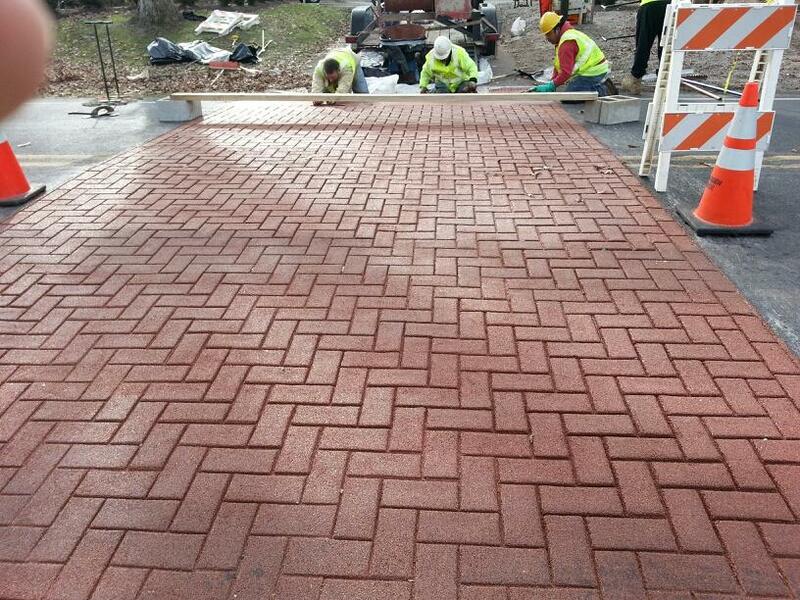 Quicker installation— Laying bricks can take multiple days and require extensive labor, thus disrupting traffic for a long stretch of time, and potentially incurring extensive costs. For a project like this, Adbruf can be installed in under a day, thus minimizing traffic snarls and costs. Consistently flat surface— If you’ve ever walked down a brick sidewalk or crosswalk, you’ll know how bumpy and uneven it can get, especially as the foundation below it expands and contracts over time. Adbruf, on the other hand, maintains its flat surface as long as the asphalt below remains true, which is generally the case since asphalt pavement has good long term stability. All in all, Adbruf surfaces minimize tripping hazards, thus making it safe for pedestrians. No loose stones— Unlike bricks, a crosswalk made with a product like Adbruf’s GeoPaveX is one solid surface, so stones will not become loose and need repair, plus weed growth is inhibited compared to brick pathways. These are just some of the benefits obtained by using Adbruf’s GeoPaveX for a crosswalk, and if you’re interested in learning more, please feel free to contact us at 215-672-8000 or info@assocpaving.com. Thanks for reading and safe travels! There is no limit to the simple creativity that abounds when it comes to the classic “art” of drawing with chalk on asphalt. It’s easy, it’s cheap, and the creations only last until the next rain, so there’s no big mess to worry about. As a result, kids love to draw on pavement, and, heck, so do many adults for that matter! Judging by the chalk filled street, it looks like people young and old had a great time with it… and that’s what it’s all about. Have You Completed Fall Preventative Maintenance on Your Pavement Yet? Seal coating is sprayed on to the parking lot at a fire station in the Philadelphia area. Well, it’s that time of year again… school is back in session, leaves are changing color and falling to the ground, and football season has kicked off (go Eagles! ).But it’s also that time to plan ahead for the winter. As we here at APCON often say, your parking lot is a “welcome mat” to visitors to your company’s premises. And if your parking lot is in disrepair, it shows your customers, guests, and employees that you aren’t keeping them in mind when they have to dodge potholes or trip on uneven sidwalks in your company’s parking lot. If you have any problem spots in your parking lot, we suggest that NOW is the best time to take care of them, before winter comes and makes them worse, and also makes it much more difficult or impossible to have them fixed until spring arrives, when more amenable weather conditions allow for the work to be completed. Crack Filling: By filling cracks, you prevent water from getting underneath your pavement, which can then freeze, expand, and cause the cracks to grow even more or create other foundation problems. Pothole Repair: Like cracks in asphalt, ice can cause potholes to worsen, but they can also expand when snow plows or shovels clear snow from the pavement or when cars continuously pass over them. Properly filling potholes will prevent them from enlarging during the winter, ultimately helping to minimize walking and driving hazards. Line & Curb Striping: As winter approaches, your parking lot lines and curbs can become harder to see when there is precipitation covering them and as nights get longer. If your striping is faded, you risk cars running over curbs, parking improperly, or not seeing directional signs on the ground. Fresh paint will also help to make your site look more welcoming. Seal Coating: Fresh seal coating can help extend the life of your blacktop by keeping water from seeping into the asphalt, causing it to break down more quickly. Not only will seal coating help extend the life of asphalt that is currently in good condition, it will also provide a dark, fresh look, serving as an ideal welcome mat for your company’s visitors. As touched on above, it is important that if you are considering doing any parking lot maintenance in the Philadelphia/South Jersey area, you should take care of it ASAP. For starters, as leaves fall, it makes jobs such as seal coating that much more difficult to do properly, and as the temperature drops, it becomes prohibitive to properly work with asphalt and related products since they need to be warm enough to cure. And let’s not forget that in 2011 it snowed right before Halloween! The moral of this story: Putting off your parking lot maintenance needs until next year could be detrimental to the lifespan of your pavement, and could also increase the danger of any hazardous areas. To talk with a representative of APCON about your parking lot’s maintenance needs, please contact us today at 215-672-8000 or info@assocpaving.com. Thank you and enjoy the start of Fall! Infrastructure is a major but necessary expense in most government budgets, so reducing the amount of taxpayer money needed to pay for upgrading roadways is always a priority. In Ohio, folks will literally be keeping an eye on the road to see if substantial savings can be realized by implementing “perpetual pavement” when repaving roads in the future. The Columbus Dispatch reports that “Ohio University researchers plan to test a new road design that they hope might last 50 years or more with nothing but an occasional new coat of asphalt.” If successful, this form of pavement would reduce costs since making extensive repairs below the surface for traditionally paved roads would cost more despite the higher upfront costs for the thicker asphalt layers needed in perpetual pavement. Testing and monitoring should take about two years to complete, at which point the state’s DOT would presumably move forward with expanding the implementation of perpetual pavement, if tests prove successful. Undoutedly, other states will be keen to hear Ohio’s results to see if it makes economic sense to install perpetual pavement for their respective roadways. Let’s hope this is a road to savings for government budgets… to be continued! Will Stiffer Pavement Help Save Gas? The online publication “Buildings” reported in May that a recent study from MIT showed that using stiffer pavement could potentially cut fuel consumption by 3% and save roughly $15 billion in gas prices per year in the US. Plus, since the pavement would need to be made to be stiffer, it is likely to last longer, ultimately saving money in the long run rather than having to repave frequently. In a nutshell, the reason for the reduction in fuel consumption is because the “softer” a pavement is, the more energy is needed to push the car ahead since the tires sink into the road more compared to a stiffer road. We think this sounds like an intriguing study, and we will keep our eye on this development to see if new guidelines are set and if customers choose to go in this direction.